So let’s get to the spring cleaning challenge of getting our homes clean for once and for all. I know I could do more than a room a week but I want to do more than just the basic cleaning so I’m giving myself the extra time to go through drawers and cupboards. Do some purging and decluttering as well as cleaning. So let’s go room by room and do some spring cleaning starting with the kitchen. I wish that I had the ability and finances to do some major improvements and upgrades to this kitchen. I hate it and there is so much that I want to do in here but for now the plan is to keep things simple and just focus on getting rid of things, organizing and doing some cleaning. From my photos you will see that my kitchen is very tiny and really cluttered. I can’t do anything about the size. Unfortunately our home is small and until we can afford a new one I have to figure out how to make better use of my space. So we are going to go through the process room by room and get things in order. Starting with this Kitchen. When I moved here years ago things just got put places without a lot of thought or planning. Some drawers and cabinets have been moved around over the years but many haven’t and now’s the time to find the best and most efficient places for tings based on how often I use the stuff in them and how I use the space. So here is how the process is going to go for these weekly challenges. On Mondays I’m going to share the space I’m working on, some pictures of the space in it’s current condition, share my plan if I know it before hand. Then on Fridays I will share the after photos and how the week went, what got accomplished and any tips I have. Then there will be a link up for you to share your own organization and home decor posts. Maybe even a giveaway some weeks. I have created a printable to help with the panning of each room. You can print it out and fill in your plan each room as we get to them. I think this will help make things easier as you go through this spring cleaning challenge. I’ve got mine printed out and ready to use this week to get me started. These are some fabulous tips! I have been working on the kitchen this week as well. I’m doing my best to get the organization gene to flourish in me. Thanks for sharing! I love this post, and what perfect timing with spring cleaning! I am definitely decluttering at the moment – I can’t handle the disorganization of my apartment right now! Small kitchens can be hard to work with. But, I love your system to help categories and realize what’s working and not working. This is great! I’m definitely sharing the print out with my mom – who needs a good spring cleaning in her kitchen! I need to get the rubber gloves on and get started on the kitchen. The pantry needs to be re-organized badly that’s for sure. Heather lawrence recently posted…Tortelloni Bolognese sauce from scratch- the perfect comfort food. It is true. Small kitchens are difficult to clean especially when you have a lot of clutter like me but I like the printable. I love that you’re committed to contentment in the space you’re in right now! Assessing what works and what doesn’t is such a wise way to look at the reorganizing. I live in a tiny house also! 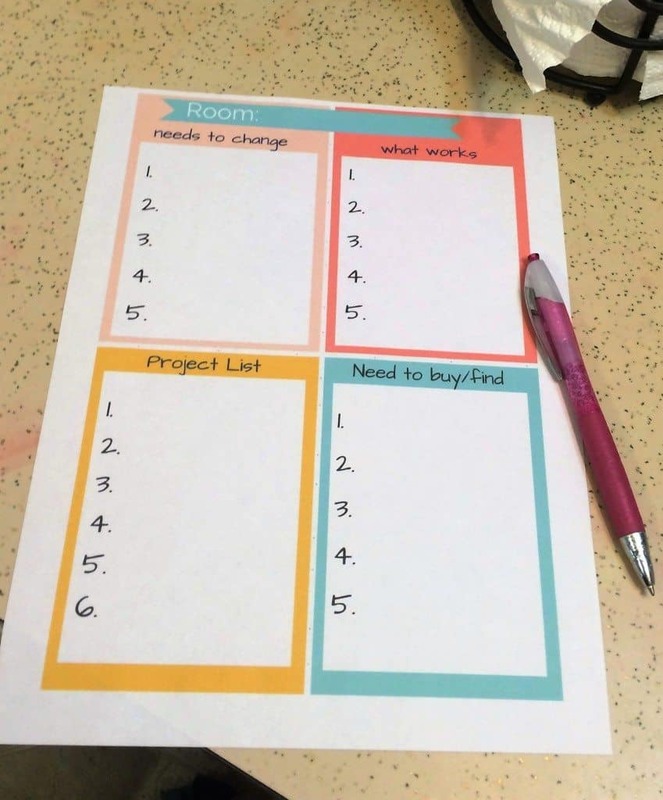 These printable will be great for helping organize and declutter! We are in full spring cleaning mode over here too!! There’s nothing better or more cathartic than spring cleaning. If I had my way, I’d throw everything out and live with just the basics. Not possible with kids, so organizing is the next best thing. I just started with my pantry today and it was a BEAST of a spring cleaning job! I am going to use these! I seemed to have skipped right over spring cleaning this year. I did a summer cleaning last year and looks like I’ll be doing it again this year. Great print out to keep on task. Seasonal cleaning is always that one task we never want to start. BUT once it’s done it was totally worth it. I would love to upgrade my kitchen, too. I just need clean counterspace. FOr some reason, my daughter puts everything on my counter. WHy?! Such a great printable that is so timely. My house is still a work in progress. This will help tons! Seeing as we are moving in a few months I definitely need to do some Spring Cleaning and Purging! I love the idea of printable for organization! It helps to keep from becoming overwhelmed with projects. WE are slowly outgrowing our current home, so I understand your sentiment. I’ve been working on decluttering the whole house before Baby gets here. I actually cleaned out the pantry today! Love this! Exactly what I need moving forward into SUmmer of 2016. We keep saying we’ll renovate the kitchen/bathrooms so I held off decorating but I think I’ll be happier making SOME changes before the renovation. Omg what a cute printable! I swear decluttering is the worst! I never know what to keep and what to throw away! What a cute printable. This is so fun when you can write it all down and check it off as you go along making the changes. Can’t wait to see it all done. I love the little printable that you have! I know I always have trouble getting my kitchen in order, but its really great to have a big spring cleaning. So freeing! Hannah Adkins recently posted…Thoughts on The Flower Chef & a Giveaway!